Cleveland Browns quarterback Johnny Manziel could be placed on paid leave while the NFL investigates an incident of erratic driving and an argument with his girlfriend. 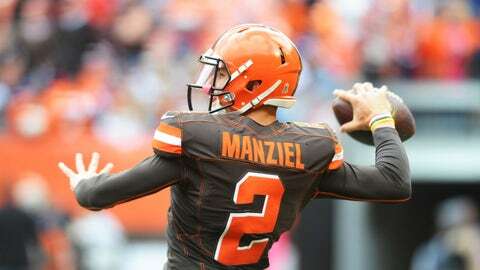 The NFL reportedly could put Johnny Manziel on paid leave as it continues its investigation into an incident involving the Cleveland Browns quarterback and his girlfriend should it be determined he violated the league’s personal conduct policy. Manziel’s latest off-the-field incident involved an Oct. 12 traffic stop that involved a disagreement over the nature of an argument with girlfriend Colleen Crowley, who accused Manziel of pushing her head against the car window during the alleged altercation. It was determined by police that both parties had been drinking but that Manziel was not intoxicated. Witness accounts of the incident included allegations that Manziel was driving erratically and that Crowley attempted to exit the moving vehicle. Crowley declined to press charges related to the incident, but that does not mean the NFL couldn’t proactively discipline Manziel to some extent, even as the league’s investigation into the matter remains ongoing. The league has not commented on the investigation, as is standard policy. Possible punishments for Manziel should the NFL find him in violation of the personal conduct policy could be a fine or suspension to even banishment from the league. Manziel sought in-patient treatment for what was believed to be substance abuse issues during the offseason, spending 10 weeks in rehab.